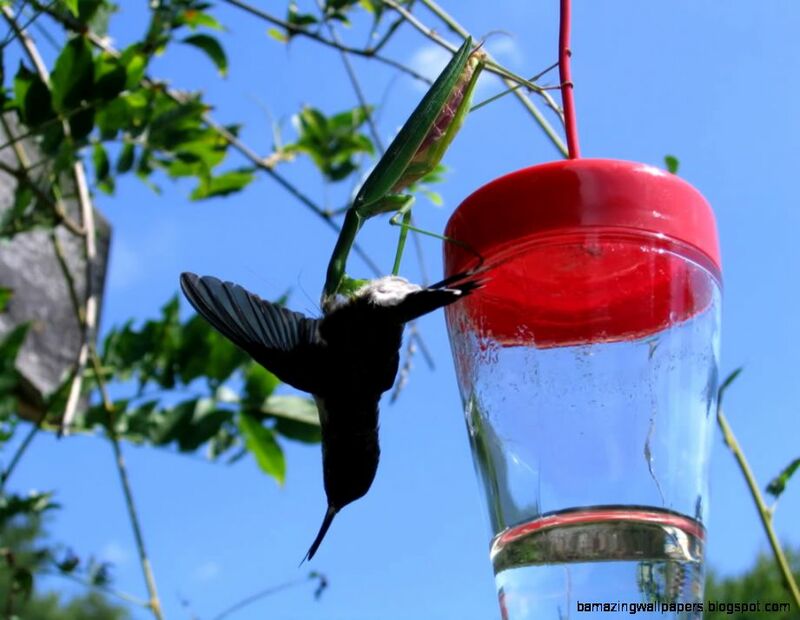 Home Diet & Eating Habits Praying Mantis Eating Hummingbird – Do Praying Mantis Eat Hummingbirds? YOU might be wondering as to how can a praying mantis eat a hummingbird perhaps because mantis is an insect and hummingbird is a bird. And scientists haven’t witnessed an insect feeding on a bird alive. But it’s true that praying mantis do eat hummingbird. They are voracious meat-eaters. The relationship between the praying mantis hummingbirds is a predator-prey. 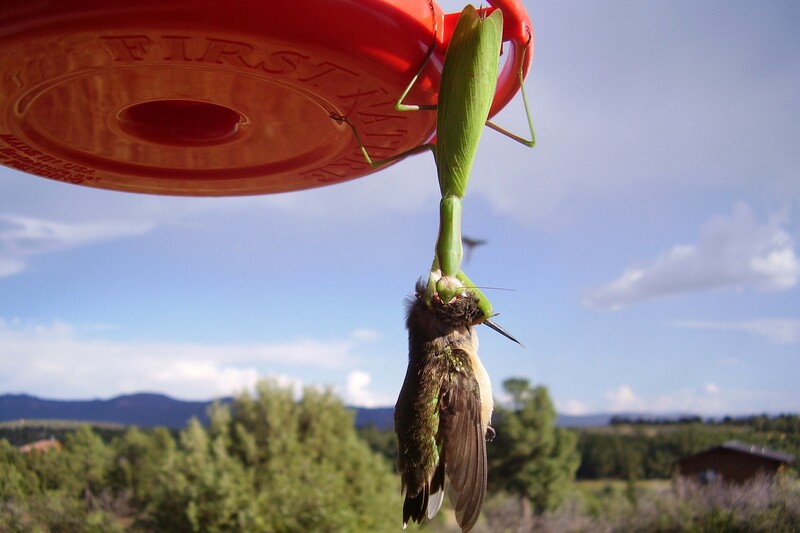 The below photograph is taken by the New Mexico resident in which a mantis preys on a hummingbird. This is one of the rarest photos—praying mantis eating hummingbird hasn’t been caught on a camera before. The picture will tell you precisely how do praying mantis eat hummingbirds. Praying Mantis Eating Hummingbird – Photograph by Tom Vaughan – Do Praying Mantis Eat Hummingbirds? The mantis attacks the hummingbird by its head (as it typically does with a regular prey). 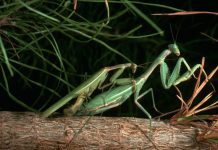 A few researchers have witnessed that mantis usually consumes a bird’s chest then followed by the rest. But in this case, it does exactly the opposite. Moments later, the mantis leaves the bird and crawls the feeder to get to the other end. Mantis is known to visit the hummingbird feeder quite frequently looking for visitors. They don’t drink sugar water; they just wait for their favorite food. 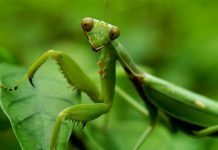 Do Praying Mantis Eat Birds Generally? Perhaps not! Hummingbirds are probably the only birds that can become victim of mantids. They are the smallest of the birds weighing up to 6 grams. Unfortunately, mantises are about the same size as hummingbirds. Once the bird is trapped in the clutches of a mantis, it becomes motionless and the predator nibbles to its neck to take the flesh out of it. 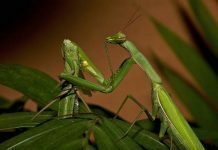 The praying mantis takes hours to consume the entire prey particularly if it’s a bird. A ravenous praying mantis attacks hummingbird. Adult mantis mostly takes on ruby-throated hummingbird. 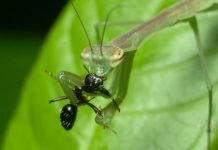 Scientists have witnessed quite a few of these mantis attacks but sometimes the observer separates the mantis from the hummingbird. Mantises do not really prefer attacking hummingbirds. They like to have flies or pollinating insects such as bees on their menu although they are capable to ambush large animals including lizards or even mice. “If you act like a bee and you’re in those places, that starts to put you at risk for getting hit by a predator,” says Kevin McGowan, an ornithologist at the Cornell Laboratory of Ornithology in Ithaca, NY. According to McGowan, hummingbirds sound like a bee that buzzes all around the nectar. 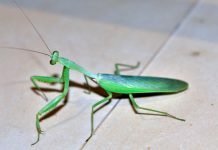 The bird’s sounds could possibly attract praying mantis otherwise mantises do not look at birds as a potential food source.